Paying off your truck loan reduces your expenses. Interest causes you to pay much more over time, and paying off your truck loan faster is a smart financial decision. If you want to pay it off sooner than expected, you may want to consider the following tips. By implementing a few simple strategies, you can reduce the time it takes to pay off your truck loan and achieve full ownership. The first step in paying off your truck loan is to gather all of the information related to your current expenses. By determining your total income relative to the amount you spend, you’ll identify any extra money that might be available to contribute towards your truck loan. It’s helpful to prioritize your loans. 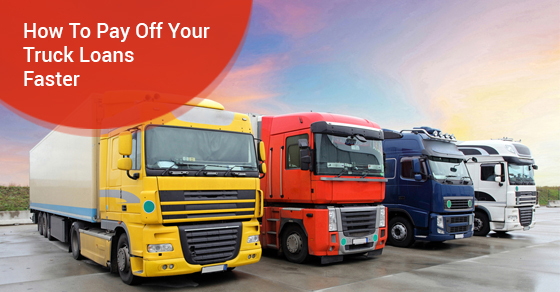 If your truck loan has the highest balance or interest rate, you can reduce the amount paid towards other creditors and apply that money towards your truck loan. Having this information in place helps you create a budget. By budgeting your expenses you can maximize the amount of money you contribute towards your truck loan and begin paying it off quickly. Your monthly payment can be made on a bi-weekly basis. This helps you reduce the amount of interest that accumulates each month. Bi-weekly payments reduce the length of time you need to make payments. Another option is to simply make one additional payment each year. This can be done at the end of the year, or you can divide one month’s payment by 12 and add that amount to each monthly payment. Refinancing your truck loan can significantly lower your monthly payments. It can also help you reduce the amount you pay on interest and allow you to pay it off faster. It’s a great option for individuals who have good credit and qualify for refinancing. Keep an eye out for any offers on low-interest refinancing from banks or other financial institutions. If you qualify for refinancing, you can take a few percentage points off of your interest rate and save money in the long run. It’s common for some lenders to offer a skip payment option to their customers. This lets borrowers have a little flexibility should they not be able to make a payment at some point. Although this can be helpful for some, those who want to pay off their truck loans faster should avoid this option and continue making payments as scheduled. Skipping payments (even if encouraged by your lender) can increase the time it takes to pay off your loan. These tips help you pay off your truck loan faster and save money on interest you’d otherwise pay. By using these and other strategies, you’ll achieve full ownership of your vehicle and reduce your monthly expenses.